We are battling through a short week after the Memorial Day holiday, and even though the month of May is closing on us, we’re excited about the summer beginning in Virginia Beach. The schools are closing soon, the tourists are on their way to the beaches, and we find that we have quite a few more visitors that drop by our office. This summer has also brought about a very strange show schedule as Long Beach and Baltimore appeared in back to back weeks. We’ve decided to skip the summer version of the Long Beach Show but will be out in full force in Baltimore. That’s our last show of the summer before the August World’s Fair of Money, but thankfully our business is no-longer focused around shows. We receive multiple packages every day from our long-time customer base, and we hope that you’ll consider working with us as well. We’d rather pay our loyal customers a bit more for the coins than another dealer or auction house, so if you have something to sell, please let us know! We would love to work with you during these warm, restful months. All that being said, we’ll leave you with the coins below, and we hope that you find something of interest! Why we love it: A lustrous slider example of this extremely scarce date capped bust Half Eagle with such stunning eye appeal that it could pass as an uncirculated coin. Only the slightest bit of wear holds it back from its incredible potential. This rare capped bust Half Eagle issue comes from a low, original mintage of just 14,485 coins struck. This is one of our favorite design types of early 19th Century U.S. coinage and it’s not a type that we come by often. Value: The PCGS Price Guide has this coin valued at $27,000. With no auction records of this date and grade EVER, it’s a difficult coin to price. However, it is available in this week’s auction with the reserve set at what we believe to be a very fair and reasonable amount of just $26,000. 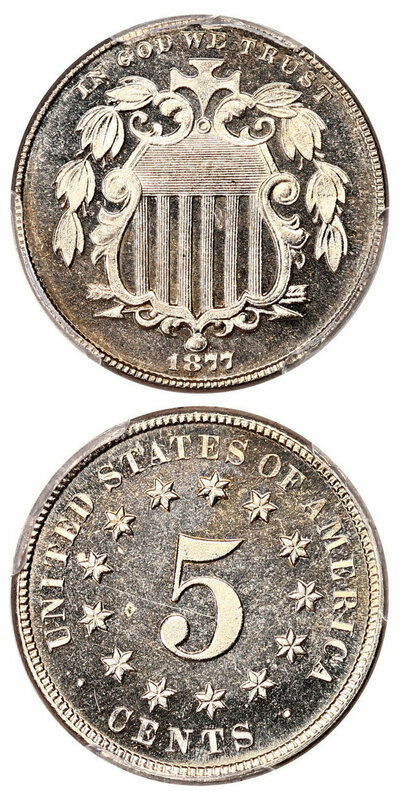 For this scarce, lower mintage early Half Eagle, you’re not going to find a cheaper example with this much eye appeal! Why we love it: A nearly perfect gem proof Barber Quarter with incredibly deep cameos in the fields and frosty devices. A very unusual piece to find with blazing white fields, these stunning proof characteristics along with blemish-free, golden surfaces make for high-quality eye appeal. This scarce proof Barber Quarter issue comes from an incredibly low, original mintage of just 792 coins struck in which only eight are graded finer by PCGS with the Deep Cameo designation. Value: The PCGS Price Guide reflects a value of $4,600 but it is available for purchase via Make Offer for just $4,000! With only eight coins graded finer out of an already low mintage, this is a great opportunity to own this stunning deep-mirrored gem example with CAC approval! Why we love it: This gorgeously toned ultra-gem Liberty Seated Half Dollar was originally from the famous Eliasberg Collection. It displays mostly bright golden toning with subtle highlights of blue and rose around the rim. The eye appeal is just incredible between its color and strong underlying luster. 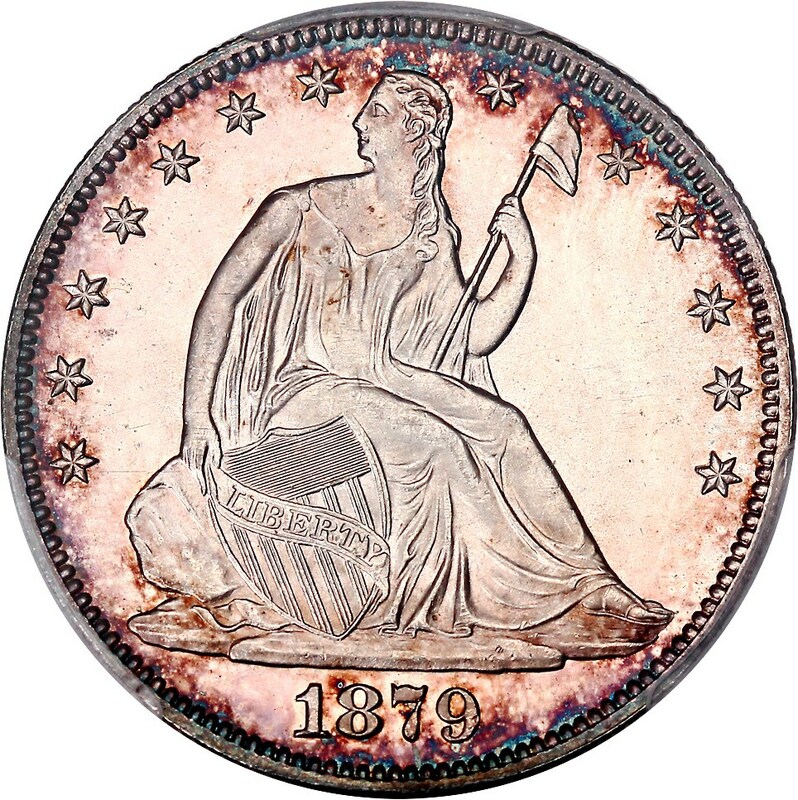 This scarce Liberty Seated Half Dollar comes from a low, original mintage of just 12,000 coins struck in which only a single piece is graded finer by PCGS (MS67+). Value: The PCGS Price Guide has this coin valued at $17,500. 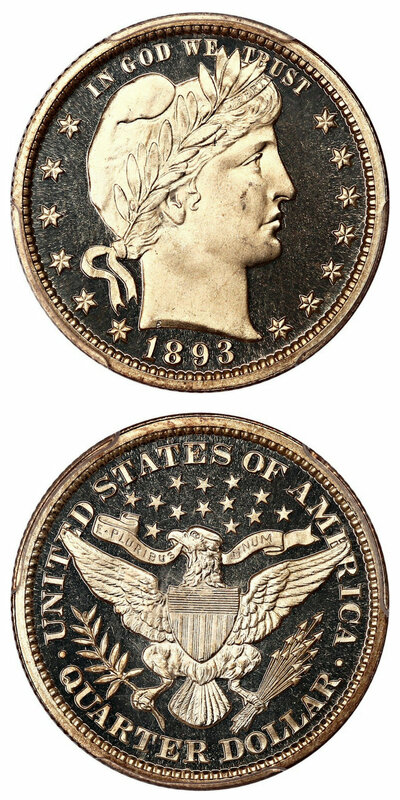 However, the most recent sales price for a similarly graded example was in 2010, where another coin sold for over $31,000! This piece is thankfully reserved for a substantial amount less at just $16,000. This fantastically pedigreed piece with lovely originality is sure to find a new home at this far more reasonable price level. Why we love it: A much better date in the Seated Half series that displays lovely toning and lustrous surfaces. The periphery of the coin is covered with beautiful blue and magenta coloring which fade into a bright, satiny white center. Value: The PCGS Price Guide reflects a value of $5,850 and is available via Make Offer at the reasonable price of just $5,400. Why we love it: An incredibly desirable first year Morgan Dollar from the popular Carson City Mint. This registry-quality gem displays pristine, bright white surfaces with plenty of strong luster that give this coin some of the most stunning eye appeal you will find from any example of this date. This popular First Year of Issue Morgan Dollar has only six other examples in existence graded finer by PCGS. Value: The PCGS Price Guide sits at $13,000; however, we are offering this coin at the reasonable price of just $10,000 via Make Offer as part of our CWL special. 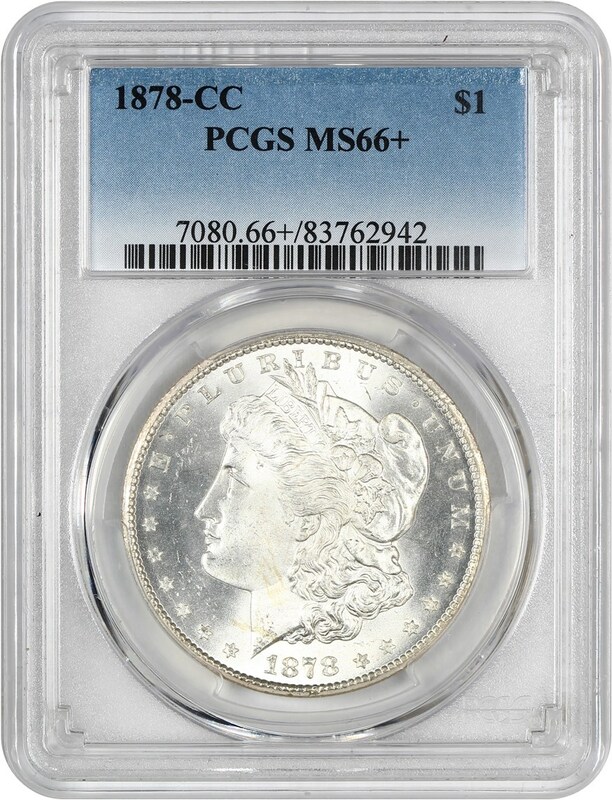 With only six examples graded finer by PCGS, this example is sure to find a new home quickly. Why we love it: A lightly toned, flashy cameo gem example of this much better proof-only date Shield Nickel. Between its solidly deep mirrors and pristine surfaces that feature few blemishes, this coin displays premium eye appeal for the grade. This rare proof Shield Nickel comes from an incredibly low mintage of 510 coins struck in which nine are graded finer by PCGS with the Cameo Designation. Value: The PCGS Price Guide has this coin valued at $6,000. It is available for purchase at the low price of just $4,500 via Make Offer! That is an entire $1,500 below the PCGS Price Guide value for this flashy gem example of this scarce proof-only issue from the Shield Nickel Series! Why we love it: An early and super desirable Half Cent type coin that is difficult to locate. This example features completely original, lightly worn surfaces with a lovely chocolate brown coloring. A scarce First Year of Issue Half Cent comes from an original mintage of just 35,334 coins struck, these pieces are paramount to any type set and are very difficult to find in nicer condition. 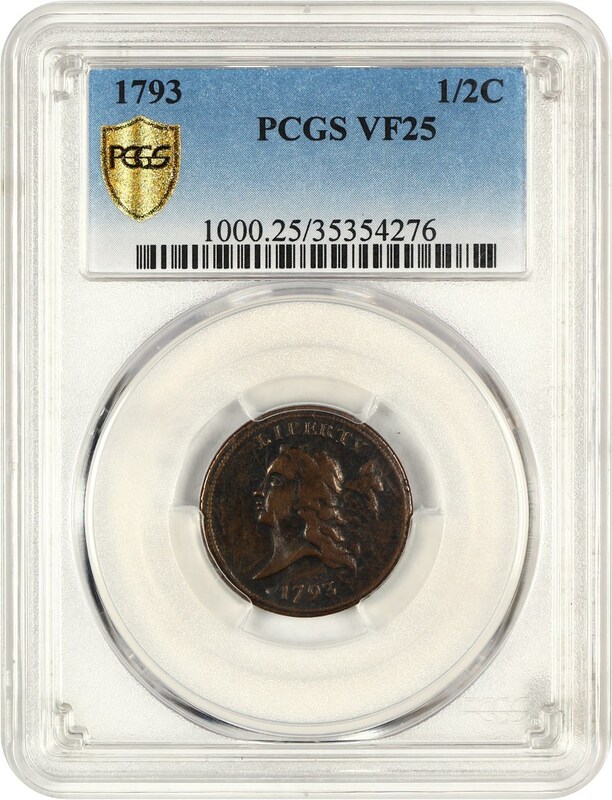 Value: The PCGS Price Guide has this coin valued at $14,500 with the CPG of a VF20 set at $14,400. Available in this week’s auction with the reserve set at the low amount of just $12,500. 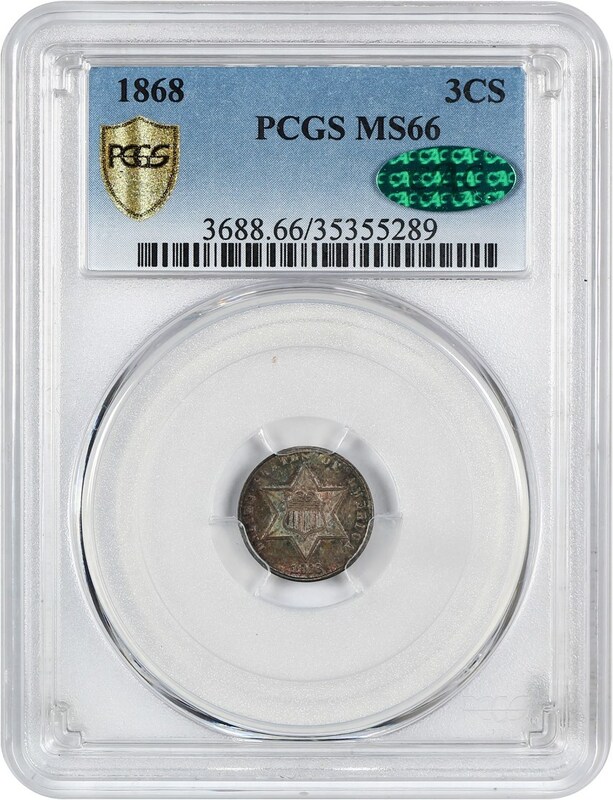 That is $2,000 below the PCGS Price Guide value for this more “affordable" example of this early, rare Half Cent! Why we love it: An extremely scarce date in the 3-Cent Silver series that displays captivating eye appeal from its incredible rainbow toning. This lovely coloring includes highlights of blue-green, rose and gold that combined with its immaculate, blemish-free surfaces. A rare Three-Cent Silver piece that comes from an incredibly low, original mintage of just 3,500 coins struck in which there is only one graded finer by PCGS. Value: The PCGS Price Guide reflects a value of $35,000 but is reserved in this week’s auction for the reasonable amount of $32,000. This rare coin has already met reserve in this week’s auction and is soon to be the crown jewel of a fantastic cabinet of Trimes! 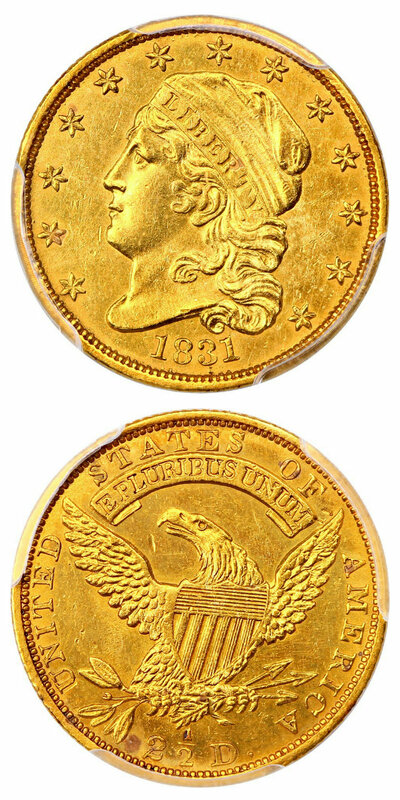 Why we love it: A scarce type coin from the capped bust Quarter Eagle series that displays ideal rich, yellow coloring and subtle remaining luster. This rare capped bust Quarter Eagle comes from an original mintage of just 4,520 coins struck and only 25,000 coins were struck for the entire type! Value: The most recent auction appearance of an AU55 was in 2016 with an auction result of $21,150. These have settled into a more affordable range, and the PCGS Price Guide has this coin valued at $18,000. With a reserve of the same price, we think that the quality and value of this coin are perfectly in-line with a Coin We Love! 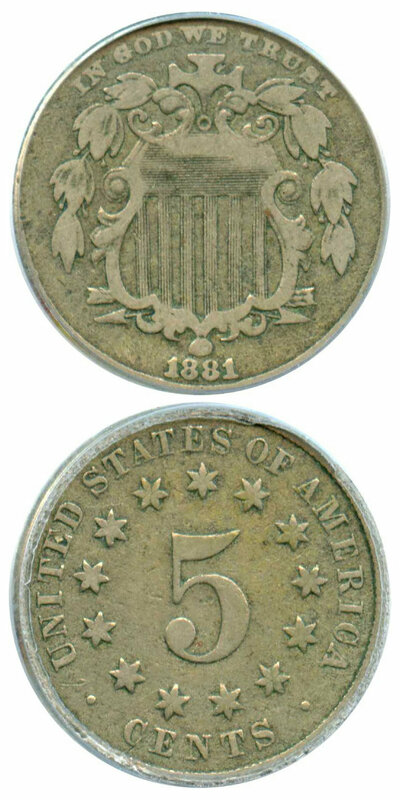 Why we love it: A pretty, near-gem type coin from the 3-Cent Nickel series featuring subtly toned, lustrous surfaces. Between its incredible eye appeal and lack of blemishes, this coin seems nearly under-graded as it appears to be a true gem making it deserve its CAC approval. Value: The PCGS Price Guide reflects a value of $450 and it is available for purchase via Make Offer for that as well. 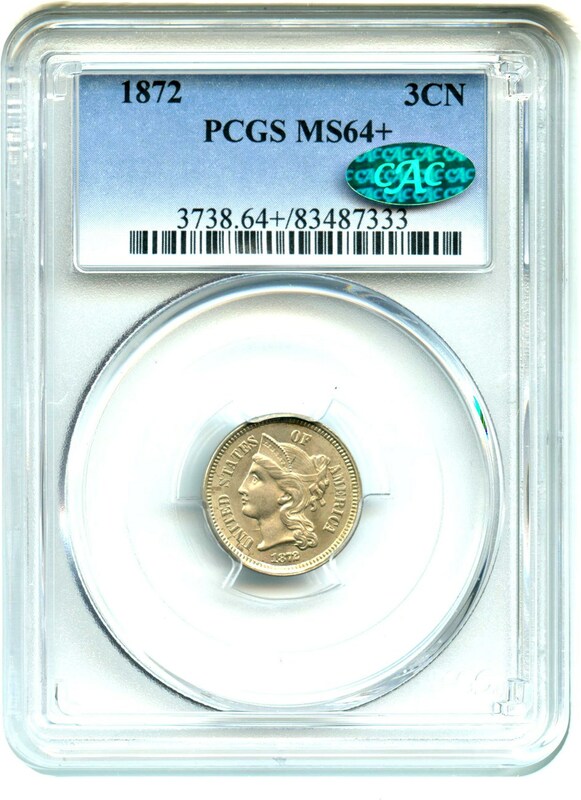 This is a great opportunity to own an arguably under-graded near-gem example of this 3-Cent Nickel type coin with CAC approval! Why we love it: An affordable yet original example of this much better date in the Shield Nickel series. This coin features attractive, original coloring and even wear with clear, visible details in the devices making it a nice example of this lower grade. Value: The PCGS Price Guide has this coin valued at $525. It is available for purchase at the reasonable price of just $450 via Make Offer! That is a solid $75 discount off the PCGS Price Guide value for this affordable example of this low mintage, much better date Shield Nickel! Why we love it: An affordable and intriguing lot of 10 nearly perfect gem Buffalo Nickel type coins. All the coins display ideal luster, blemish-free surfaces and well-struck devices that feature sharp, clear detail giving them premium eye appeal. This is an incredible opportunity to acquire these gorgeous final year of issue Buffalo Nickels for a fair price. Value: The PCGS Price Guide has this lot of 10 coins valued at a combined $700. The group is available for purchase at the low price of just $450 via Make Offer. That is a solid $250 discount off the PCGS Price Guide value for this fantastic set of 10 gem final year of issue Buffalo Nickels! 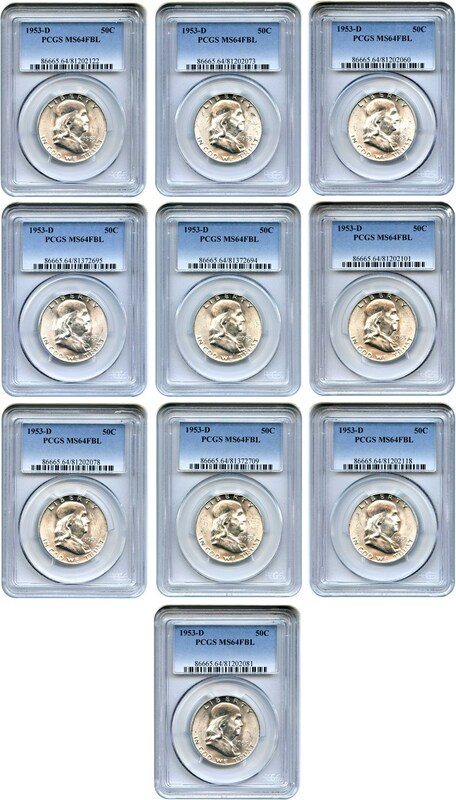 Why we love it: A sizeable lot of ten earlier, near-gem Full Bell Line Franklin Half Dollar type coins. All 10 coins feature clear full bell lines and well-struck devices with sharp detail giving them high-quality eye appeal. This is a fantastic chance to obtain these attractive Franklin Halves that display incredible luster across the board for a reasonable price. 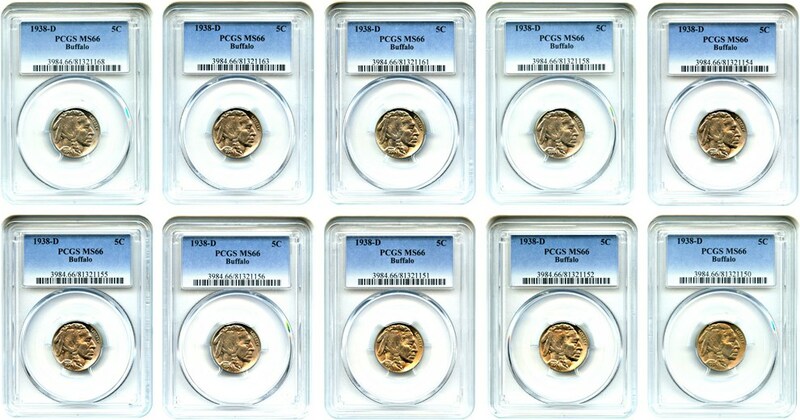 Value: The PCGS Price Guide has this lot of 10 coins valued at a combined $520; however, this group is available for purchase at the low price of just $300 via Make Offer. That is a solid $220 discount off the PCGS Price Guide value for this set of 10 near-gem Franklin Half Dollar type coins! 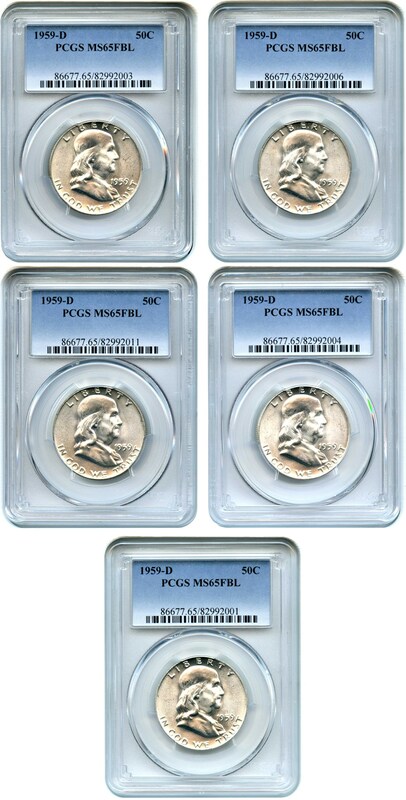 Why we love it: A intriguing lot of five stunning, lustrous gem full bell line Franklin Half Dollar type coins. All the pieces display pristine mostly white gem surfaces that feature well-struck devices, few blemishes, clear full bell lines and strong luster. Value: The PCGS Price Guide reflects a combined value of $375 for this lot. The group is available for purchase at the fair price of just $400 via Make Offer. Auction #1017 Lots Posted. Browse & Bid Now! Auction #1016 Lots Posted. Browse & Bid Now!